The latest Grant Vortex Pro External condensing combi models feature internal frost protection, 24ltr expansion vessel, neon diagnostic indicators and a factory fitted internal condensate trap (this can be sited externally if preferred), all designed to make installation and servicing easier. 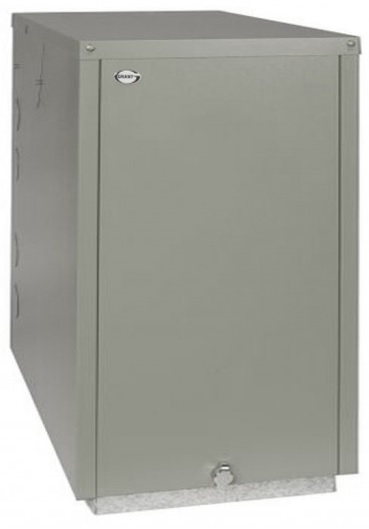 They also feature a multi-directional factory fitted low level flue, external powder coated robust casing, built-in frost protection, a mains isolating switch and a test switch. The boilers come in three sizes, 21kW, 26kW and 36kW. Grant Vortex Pro Combi boilers have larger plate heat exchangers which due to their low water content and great surface area, vastly increase hot water performance. Mixing valves on the unit are pre-set at 50°C, which accurately control the hot water draw off temperature from the boiler. They also include a low system pressure cut off switch, enabling the combi to protect itself in the event of system water loss. Additionally, there are two very intelligent electronic temperature controls which allow the boiler to operate in condensing mode on central heating, whilst keeping the instant production of hot water. Available in three models – 21kW, 26kW* and 36kW. Recovery time 3 minutes approx. Based upon 100 litre draw off. *Hot water flow rate is dependant on mains pressure available.